These sandals boast a unique design, which is bound to boost both your comfort and sense of style. The genuine leather has been carefully arranged to truly catch the eye. The beauty of these handmade sandals is found in what appears to be a complex design, but is actually a simple arrangement. Three thin leather straps arch across the top of the foot, while a simple leather toe loop holds the big toe in place. The three leather straps are held together firmly by a horizontal piece of leather, which is attached to the sole. Although the design may appear to be complex, it is actually a straightforward arrangement. All in all, it produces an elegant and stylish effect. Furthermore, the materials used to craft these sandals are of the highest quality. 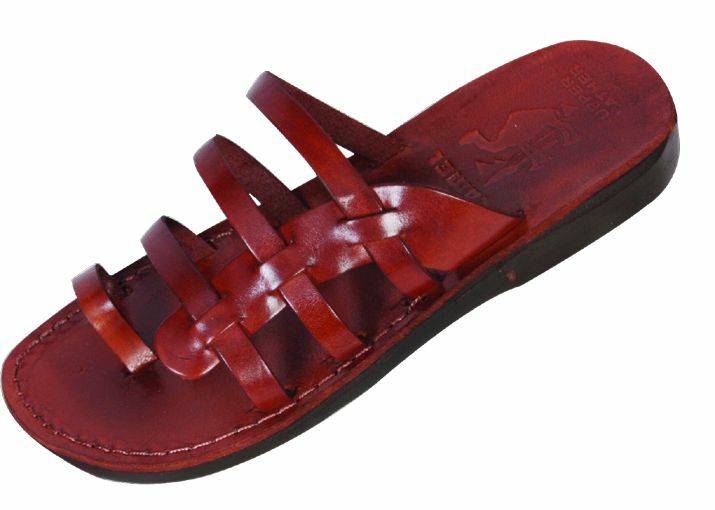 Genuine leather is used throughout the manufacture of these sandals. It is attached to quality rubber by high class hand-stitching. Intriguingly, these sandals are based on the biblical sandals of over two thousand years ago. With similar designs found by archaeologists across Israel, these sandals evoke real history.